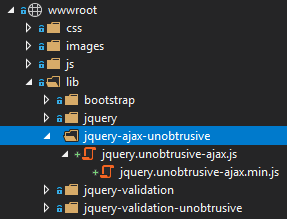 The jQuery Unobtrusive AJAX library has been around for almost 10 years, and was first introduced in ASP.NET MVC 3.0, just as adoption of HTML5 custom data-* attributes was becoming commonplace and supported widely across browsers. It is a small library, 4kb when minified, that makes use of jQuery's AJAX capabilities. It is now part of ASP.NET Core and is hosted at GitHub. Unobtrusive AJAX, like other unobtrusive libraries, works by examining selected HTML elements for the presence of specific custom data- attributes, and then attaching jQuery's AJAX functions to those elements when they are clicked. In essence, it saves much, if not all of the boilerplate code that you would otherwise have to write to fire an AJAX request and process the response. data-ajax Must be set to true to activate unobtrusive Ajax on the target element. data-ajax-confirm Gets or sets the message to display in a confirmation window before a request is submitted. data-ajax-method Gets or sets the HTTP request method ("Get" or "Post"). data-ajax-loading-duration Gets or sets a value, in milliseconds, that controls the duration of the animation when showing or hiding the loading element. data-ajax-loading Gets or sets the id attribute of an HTML element that is displayed while the Ajax function is loading. data-ajax-update Gets or sets the ID of the DOM element to update by using the response from the server. data-ajax-url Gets or sets the URL to make the request to. When an AJAX request is made using jQuery, a jqXHR object is returned. This is made available to callback functions that you specify via the data-ajax-complete, data-ajax-success and data-ajax-failure attributes. When the AJAX post completes (successfully or otherwise), the completed function is called with the jqXHR object as a parameter. The response body is available in the responseText property. The data-ajax-update attribute is used to specify the DOM element that should be updated with the response. The value passed to it is a standard CSS selector. If multiple elements match the selector, the first matching element will be updated. Setting the data-ajax-mode attribute to after will result in the response being appended to any existing content. Sometimes, as a courtesy to users to let them know that something is happening when an asynchronous operation takes a while to complete, an indication of progress is displayed. This usually takes the form of an animated gif image, or an animated font. The data-ajax-loading attribute specifies the element that should be displayed while the AJAX operation is taking place. The data-ajax-loading-duration attribute takes a value in milliseconds. This is used to determine how long it takes to make the loading element visible and then to hide it. The loading element slides down and to the right when becoming visible. If no value is specified, the default is 400. In this example, a spinner from the FontAwesome font collection () is used to show progress. It has its display property set to none initially. jQuery will remove that setting before the request is sent, and then reapply it once it has completed (regardless of success).